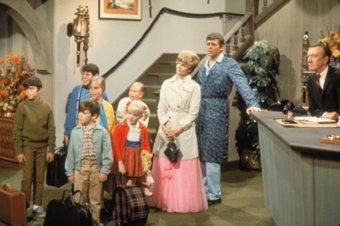 Robert Reed starred as Everyfather Mike Brady, with singer Florence Henderson finding the right pitch as Carol Brady. They clicked as a couple and were believable as former single parents of three (he, three boys, and she, three girls) who married and combined their broods. People who study birth order behavior will be hard-pressed to find anything askew here. The oldest—Greg (Barry Williams) and Marcia (Maureen McCormick)—often take the center stage, as siblings are apt to do in real life. The youngest—Bobby (Mike Lookinland) and Cindy (Susan Olsen)—struggle to shed the “baby” image. 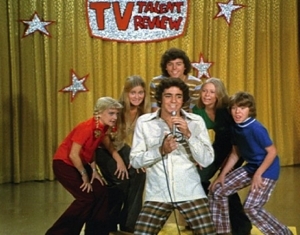 The middle children, meanwhile—Peter (Christopher Knight) and Jan (Eve Plumb)—have to work overtime to create a niche for themselves. Maybe that’s why, as corny as the shows were and as naively clean-cut as the Bradys seemed during the show’s five-year run, audiences kept coming back for more—even when the show went to daytime syndication. It will come as no surprise that Sherwood Schwartz, the man who brought viewers Gilligan’s Island, was responsible for this tale of a blended family stranded together under a single, sometimes straining-at-the-seams roof. That’s because their antics can seem just as corny as Gilligan and the Skipper’s. Is it dated? Certainly. But now that’s part of the fun, part of what makes it an entertaining show. The Bradys were a lovable bunch, poised somewhere between those cherubs whose cheeks you want to pinch and the goody-two-shoes so out of touch with the way normal people behave that you want to laugh at them . . . or shake them. Of course, that’s what director Betty Thomas did in The Brady Bunch Movie (1995), which poked enormous fun at this blended California family from the Seventies who acted like it was the Fifties. When they uttered a word like “groovy,” it never sounded so interplanetary. 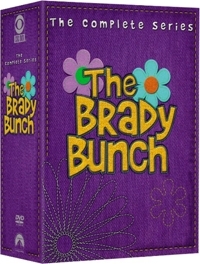 For five seasons, though, the Bradys found an appreciative audience that watched the Brady kids grow up right before their eyes. By the fifth season, the child actors had grown so old that Williams was rumored to be having a fling with onscreen stepmother Henderson, as well as a few close encounters with onscreen sibling McCormick. Cutesy scripts that used to be enough to force a smile were suddenly fitting everyone as awkwardly as the infamous Johnny Bravo suit that Greg tried on for size in one episode. It’s one thing to watch little kids putting on a production of “Snow White and the Seven Dwarfs” in their backyard, but teens? Kids will still love the series by the fifth season, but adults probably will have had their fill by the third. Later episodes are a lot more “far out”. . . and that doesn’t necessarily mean groovy. Peter has a double, they put on a play, they act in a film and throw pies at each other, they dress up for a UFO episode, they have dream sequences, and there’s a show that uncharacteristically actually tackles racism. But the series really jumped the shark when the producers brought in a young kid to be the new live-in honorary Brady, Cousin Oliver (Robbie Rist). Still, this is one wholesome, classic American TV series that remains perfect for family viewing, with plenty of warmth and laughs . . . some of them intentional. 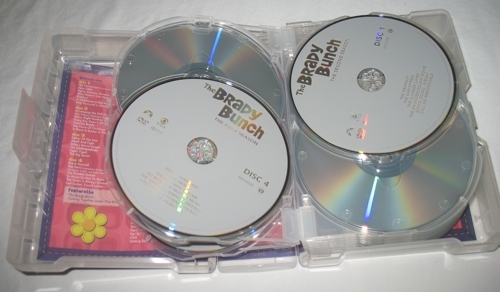 A word on the space-saving packaging: With this set, which is housed in a newly designed hard plastic case with single discs on single-page spindles to keep them from getting scratched, you really only save the width of one standard DVD case. So if you already have Seasons 1-5 with the individual hologram covers, there’s no need to upgrade, if that’s your only motivation.